Green iguanas are found throughout tropical and subtropical North and South America. Green iguanas are common in Mexico and south throughout Central America and down through South America to Paraguay and Argentina. Green iguanas also occur throughout the Lesser Antilles and, in the past 20 years or so, the Greater Antilles and Southern Florida. In the Greater Antilles and southern Florida, green iguanas are an introduced species. There is a definitive difference in the physical appearance of green iguanas depending on their locale. First, the South American green iguana population used to have the taxonomic name of Iguana iguana iguana. South American green iguanas are much less cold tolerant than the Central American green iguanas once referred to as Iguana iguana rhinolopha. All these subspecies are now synonymous, and there is only one recognized species: Iguana iguana. Green iguanas from some parts of Central America have horns on their noses ranging in size from small bumps to quite large flexible horns over a ½ inch long. 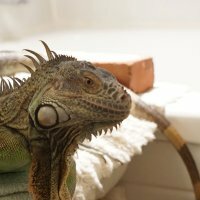 The green iguana is arguably the most common reptile in the pet trade today. Green iguanas are readily available and almost one million are imported into the United States annually as babies. It is true that these wonderful lizards make personable pets, but very few people who purchase them can meet the requirements of an adult green iguana.